Disclaimer: I received this book free on behalf of NetGalley & Harper Collins UK. Synopsis: Parker Grant doesn’t need perfect vision to see right through you. That’s why she created the Rules: Don’t treat her any differently just because she’s blind, and never take advantage. There will be no second chances. When Scott Kilpatrick, the boy who broke her heart, suddenly reappears at school, Parker knows there’s only one way to react – shun him so hard it hurts. She has enough to deal with already, like trying out for the track team, handing out tough-love advice to her painfully naive classmates, and giving herself gold stars for every day she hasn’t cried since her dad’s death. But avoiding her past quickly proves impossible, and the more Parker learns about what really happened – both with Scott, and her dad – the more she starts to question if things are always as they seem. The plot…is steady, solid and captivating. No, it’s not crammed full of action or massive plot twists – but I don’t think it should be, either. This book is written on a day-to-day basis, but that doesn’t make it boring. It makes it realistic. The characters…are likeable, sweet and funny. I love Parker, she’s sassy and makes you laugh throughout the book. But things aren’t always laughable…and Parker makes sure you feel that, too. Basically, I really felt connected with Parker – and other people – in this book. 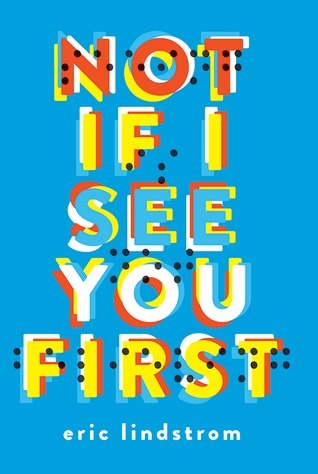 Not If I See You First is full of excellent, very skilled character building, and that’s what makes this book so great. The writing…just adds to the list of things to admire in this novel. It is truly lovely – but personal, too. I felt like Parker was writing it – and for a first person story, that is exactly the way to make a reader feel. I really look up to Landstrom…because his skill and obvious passion for writing is outstanding. Something I liked…is the real unique-ness that comes with this novel. This is the first book I’ve read with the main character being blind – but it really worked. Landstrom made sure not to stray too far from the norm that comes with contemporary YA, but still made it different enough for me to love even more. Something I disliked…nothing I can think of! Though at the very, very start of the book I wasn’t sure whether I would love or be annoyed by Parker’s badassery. It really could have gone one way or the other. Lucky for me, it went in the ‘love’ direction – especially when Parker’s emotional, vulnerable interior shone. My thoughts…this book made me cry, laugh, feel humiliated, embarrassed, emotional, happy and loved. This book took me through an entire spectrum of emotions. This book made me feel – and that is exactly what I look for when I’m reading. So congrats, Eric Landstrom. I wish I could write like you.